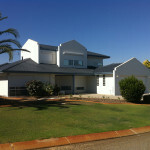 Is your roof looking old and in need of a quality coating? 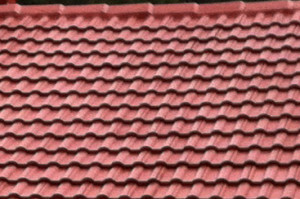 Roof Coating Industries can professionally recoat your cement, clay, iron or asbestos roof with top quality coating and a colour of your choice. 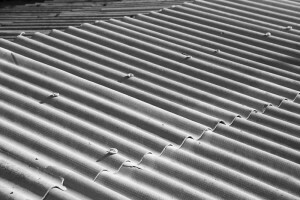 Your roof will be sealed and take on the appearance of a new roof! Replace-repair broken tiles using matched tiles. High Pressure water clean entire tile area to remove all dirt, moss and oxides. Hose out gutters and check flow of downpipes and other water collection flashings. 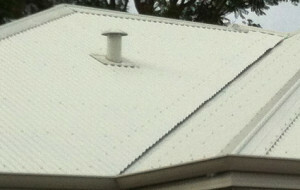 Replace any broken ridge cappings. All valleys and other various flashings are checked and repaired and sealed and coated if necessary. Attend to any suspect leaking areas. All ridge and hips are completely resealed using FLEXIPOINT. Apply 1 COAT of Dulux Primer. Apply 2 COATS of Dulux Acra-Tex 962 Roof Membrane. Leave spare tiles, spare paint and leave site clean and tidy. Any unserviceable sheets are replaced. All sheets Tek screwed with a minimum of 4 per sheet. Lifting sheets secured using Tek stitching screws. High pressure water clean entire roof area to remove all dust and flaking paint. High pressure water clean all gutters and check flow of downpipes. Repair any large rust holes using scrim and elastoseal..
Wire brush down rusted areas and apply Rusteater Rust Converter to these areas. (Spot Prime). Apply 1 coat of Dulux All Purpose Primer. Apply 2 coats of Dulux Acra-Tex 962 Roof Membrane Iron Roof Coating to entire roof area. Leave site clean and tidy. P1 or P2 facemasks, disposable coveralls and safe footwear worn in accordance with Worksafe W.A. requirements. All loose debris residents on the surface or in the gutters shall be removed as per the Asbestos Waste Management Act (1994). Longitudinal cracks in the sheets repaired by embedding 100mm wide open weave nylon webbing of a similar profile. Check and secure all screws, replace if necessary using 100mm Climaseal cyclone-proof tek screws with Weatherlock washers. Apply Crommelin’s Fibroseal Primer as per specifications. Apply Crommelin’s Fibroseal Topcoat as per specifications to ensure minimum 200 micron thickness is achieved.